Super Savings Item! Free Shipping Included! Save 33% on the POWER GUIDANCE Arm Blaster for Bicep Curls - Fitness Arm Curl Blaster - Premium Grade Bicep Bomber Isolator for Bodybuilding & Weight Lifting by POWER GUIDANCE at Strongman Pictures. MPN: PGARMBLASTER. Hurry! Limited time offer. Offer valid only while supplies last. Enhance your BICEP CURLS - Our Uniquely contoured design allows you to isolate your arms and shoulders while keeping your back and elbows locked in the perfect curling position. Premium quality and unique design - The padded neck strap is quick release so you can to adjust it to the perfect position.And the contoured rigid metal design isolates your arms and shoulders, acting as great arm supports. 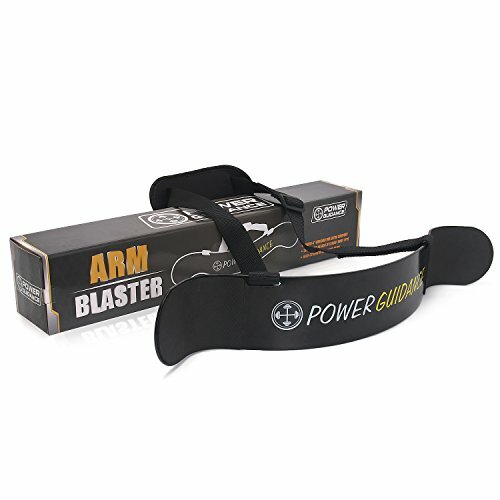 One Size Fit All - POWER GUIADNCE Arm Blaster offers a secure fit for anyone looking to enhance and boosting their bicep curls and building routines with proper form and better leverage. Comfort Fit - Carefully designed with continuous research by fitness experts, customer's demand and satisfaction research. Features thick padded elbow pads for safety and comfort, supreme foam neck padding and fully adjustable strap to give you premium comfort and stability. If you have any questions about this product by POWER GUIDANCE, contact us by completing and submitting the form below. If you are looking for a specif part number, please include it with your message.